December 9, 1997 marks the 203rd anniversary of the beautiful and historic St. Louis Cathedral. On this day, the elevation of the Cathedral to a basilica was complete with two intricatel accoutrements that are necessary to complete this process; the canopeum (umbrella and the tintinnabulum (bell). 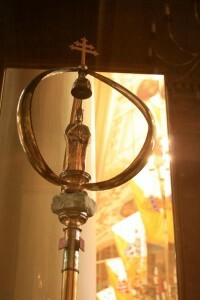 Originally, these two instruments served practical purposes; the canopy was used to shelter the arriving patriarch and the bell heralded his entry into the church. Now they serve a symbolic purpose; they remind us of our connection as a basilica, with our patriarch, the Holy Father. Both the umbrella and bell are custom designed and custom made, ours by the Stadelmaeier Studios of Nijmegen, Holland. They are truly pieces of art in their own right. The umbrella is made of red, yellow and white fabric, the colors of Rome and the Vatican State. The eight flaps are ornamented with fitting symbols from the 1964 elevation: the coat of arms of Paul VI, the coat of arms of Archbishop John P. Cody (Archbishop at the time of the elevation), symbols of St. Louis King of France (patron of the Archdiocese), our Lady of Prompt Succor (patroness of our State), the City of New Orleans, the State of Louisiana, the date the Cathedral was designated a minor basilica and our special basilica symbol. The bell is adorned with a hand-crafted sculpture of St. Louis, our patron. There are two new elements, though, which make our standards truly unique. On each pole for both the umbrella and the bell, is a specially designed node with the Lion of Judah—a symbol meaningful in the history of the Doley Family, who are the donors of these gifts. 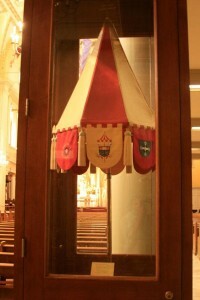 On the umbrella is a special banderole with the names of Archbishop Philip M. Hannan and Archbishop Francis B. Schulte, who have led our Archdiocese in the years between its elevation to the rank of basilica and the reception of the basilica symbols. Names of future archbishops can be added to the banderole. The umbrella and bell will be placed in the sanctuary of the church as a constant reminder of our status as a minor basilica. They will also be carried into the church on special occasions, to lead solemn liturgical processions throughout the year. These symbols are a gift from the estate of Harold and Kathryn Doley. Mr. Harold and Mr. Keith Doley presented the umbrella and bell to the Archbishop Schulte during the liturgy. 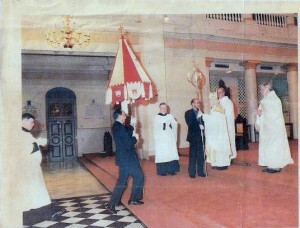 ARCHBISHOP FRANCIS B. Schulte accepts the two symbols of a basilica, the tintinnabulum (bell) and canopeum (umbrella), from members of the Harold and Kathryn Doley family, whose estate donated the gifts. Harold Doley III hands Archbishop Schulte the bell, which is adorned with a hand-crafted sculpture of St. Louis King of France, patron saint of the Archdiocese of New Orleans. Keith Doley brings up the umbrella, which is crafted of red, yellow and white fabric, the colors of Rome and the Vatican State. The Doley Foundation paid tribute to their Native Louisianians of African decent and Roman Catholic heritage with the dedication of a new sculpture at the family’s plot in St. Louis No. 1 Cemetery in New Orleans. 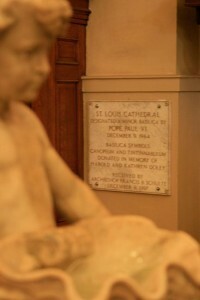 Archbishop Alfred C. Hughes of New Orleans blessed the sculpture along at a special ceremony with the family on February 3, 2008. The categories are written in three languages: Arabic, Haitian Creole and English. The first Doley in New Orleans arrived in August of 1720, 80 years before the historic St. Louis No. 1 Cemetery was built. The family takes great pride in their ancestry and hopes the new sculpture will stand as a reminder to all of the accomplishments of Louisiana natives. The Illinois Club was founded in 1895 by Wiley J. Knight. In the kitchen of Erona Doley the organization was first known as the Illinois Social & Pleasure Club. In 1926 a dispute among members over whose daughter would reign as queen prompted the disillusionment of the former Illinois Social & Pleasure Club and the original Illinois Club and the Young Men Illinois was created. Clubs reflected the new date of incorporation 1926. Haydel was an entrepreneur extraordinaire. He owned and developed the largest cemetery in the South. He built America’s first African American sub-division. He also developed his own shopping mall in Eastern New Orleans in the late 1960’s with nationally recognized anchor national tenants. He founded the Majestic Life Insurance Company and mortuary. All of these businesses are still profitable and going concerns with a history of almost a century.